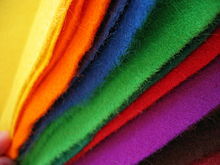 ↑ "What’s the difference between wool, acrylic, wool blend, and eco felt? Part 1 Wool.". 31 مارچ 2009. https://americanfeltandcraft.wordpress.com/2009/03/30/woolfelt/. ↑ "Acrylic felt & eco- felt (I.E eco spun) same damn thing! Part 2 of whats the difference between wool, acrylic, wool blend, and eco felt?". 1 اپریل 2009. https://americanfeltandcraft.wordpress.com/2009/04/01/acrylicecofelt/. ↑ "Wool Felt Blends- part 3 of Whats the difference between wool, acrylic, wool blend, and eco felt?". 4 اپریل 2009. https://americanfeltandcraft.wordpress.com/2009/04/03/wool-felt-blends-part-3-of-whats-the-difference-between-wool-acrylic-wool-blend-and-eco-felt/.